A cross between an exotically coloured snowdrop and a fuchsia flower, known as 'Coral Drops'. The corms are quite small, but this belies the truly spectacular displays that erupt from inside. Each one a lovely coral red colour, with contrasting creamy centres, and often creamy stripes. They work really well planted 7-10 bulbs per 25cm pot, grown in hot sun. Supplied as a pack of 25 bulbs size 5+, to plant into pots or garden soil straight away. This gorgeous little delight called Bessera elegans looks like a cross between an exotically coloured snowdrop and a fuchsia flower, but is known by it’s common name of ‘Coral Drops’. The corms are quite small, but this belies the truly spectacular displays that erupt from them in late Summer. 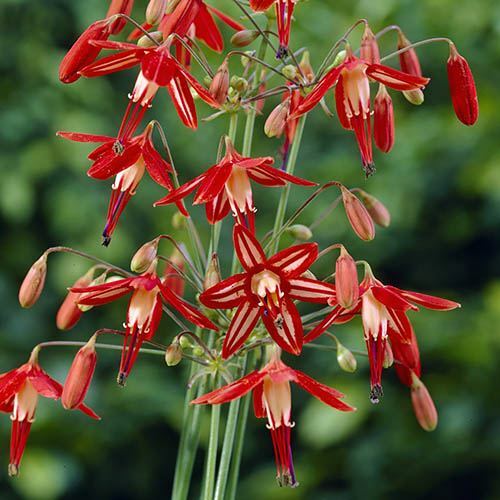 Stems of up to 45cm tall will bear up to 20 individual flowers, each one a lovely coral red colour, with contrasting creamy centres, and often creamy stripes inside the petal – such an unusual colour combination. They work really well planted 7-10 bulbs per 25cm pot, grown in hot sun – we do not suggest growing in the soil in the UK. Feed them well in season with a balanced feed, and they will reward with spectacular displays. They will flower in August into September. They are frost-tender, so after flowering, let the stems die back, but move the pot inside and dry right back until following Spring, when they will grow away in even bigger clumps. They can tolerate a little cold down to -5C, but not Winter wet, and if you do this will reward you with many years of flowering. ‘Coral Drops’ are a delightful little Summer firecracker, and well worth growing for something unusual and rarely offered in the UK.